While employed in the engineering department of the Budd Body Company of Philadelphia, William Muller convinced his employer to invest in developing a front wheel drive prototype automobile. Budd would then sell the rights of the car to an automotive company which would allow Budd to produce the body work. While Muller designed the drive train, Joseph Ledwinka designed the body for the car and the project was completed in 1928. Instead of attracting an automotive producer, Muller’s concept car attracted the attention of Archie Andrews, a member of Budd’s Board who also sat on the Board of Hupmobile. Andrews recognized the possibilities of producing the car and made it possible for Muller and Budd to present the idea to Hupp. When Hupp passed on the car, Andrews took on the project himself, and with Muller formed New Era Motors which would market the car. Still, Andrews lacked an ability to build the car, and hoped-for support from Peerless, Gardner and Marmon failed to materialize. 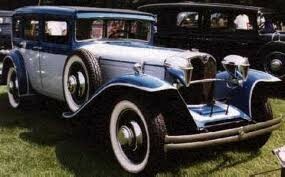 In November 1929, Moon Motors reached an agreement to build the car, which Andrews had by then named the Ruxton, after William V.C. Ruxton, an investor Andrews hoped would support the project; Ruxton didn’t support the project, but it bore his name whether he wanted it to or not. When Ruxton finally went on sale, some models sported Joseph Urban color schemes designed to lengthen the appearance of the car through broad bands of white intermixed with vivid colours such as blue, lavender and navy blue. Many, but not all, Ruxtons featured the cat-like Woodlight headlights; while sleek, their performance paled in comparison to normal headlights. Most Ruxton owners soon learned that they either drove their cars during the daylight, or had them retrofitted with normal headlights or auxiliary driving lights.